“The only thing I trusted was the scalpel in my hand,” she remembers. “But now, after using USANA products and sharing the USANA vision with others, I have found that this company can help many more people to be free from pain and suffering, to be free from disease, then the scalpel or acupuncture needle can. USANA can also help people obtain financial freedom. The quality of USANA products and the unique vision of Dr. Wentz are the things that changed this couple's opinion about nutritional supplements and the industry as a whole. Fin Yang says, “We went from being sick of network marketing to becoming active Associates. 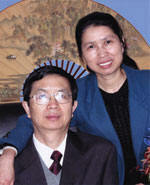 She and her husband, Frank Feng have been with USANA for five years. They believe that experiences while sharing Dr. Wentz' vision during that time have demonstrated that making the right choice is as important as hard work. “In the business of network marketing, the right products, the right company, the right compensation plan, and the right timing are all important,” they assert. When prospecting for new Assoicates, this talented duo looks for certain qualities that make up a good team member. “A good team member must be a good person,” they explain. “In this business, if you wish to be successful, you must understand that being a good person is essential. Good people keep their integrity at a high level. Good people keep promises and are honest. Good people share their vision with others and inspire others to achieve their goals. Good people are also good leaders, great motivators, and excellent trainers. The more people you lead and train, the more successful you will be. This is a business of sharing the vision and spreading information to others. As these new 1-Star Diamond Directors watch USANA grow steadily, they hope to work with more people around the world.